Update 2012-09-03. After reading my rave reviews about Tim Ho Wan in Sham Shui Po, my mom (who had been to Tim Ho Wan at the Hong Kong station) decided to visit the restaurant to see if it was really that good. We arrived together and we ordered the same dishes which I placed in my recommended list. We were both very disappointed. Dishes we ordered were: Char siu baau (Baked barbeque pork bun) 雪山叉燒包, Lotus root pie 蓮藕餅, Turnip Cake 蘿蔔糕, Rice noodle roll with pig intestine 腸粉 and Osmanthus Jelly 桂花糕. The only saving grace was that the pig intestine was delicious. But every single dish was so-so. For example, the Osmanthus Jelly 桂花糕 I had was so light that it falls apart upon touching with chopsticks on my first visit - but this time it was exactly the same as everyone else's. Conclusion? I suspect that it was unusually good the first time (when this blog post was initially published) because the television crew was there and so the head chef must also be there. This time it was just another day at the restaurant - even the staff was not as polite and professional as the ones before. Given this experience, I can no longer recommend this place. My recommendation to the owner Ah Gor: unless you can make sure that the quality level is consistent and can live up to your standards, do not open up another location. If the brand experience cannot be maintained, it marks the beginning of your end. Usually where Michelin-Star restaurants are concerned, you need to be prepared for a dent in your wallet if you wish to satisfy your tummy. Well, apparently not so in Hong Kong. Recently, I got asked by a friend (Jonas) about places to go for great food in Hong Kong. His best friend (Tobias) was visiting for a week. As a food connoisseur, Tobias prefers to dine at restaurants with Michelin stars only. I quickly pulled out the 2012 starred restaurants list which was helpfully provided by the Hong Kong Tourism Board. As a foodie, I have dined at many of the restaurants on the list, but the idea of splurging daily over a week-long period sounded like a piggie-bank suicide. Stumbled, I turned to my parents, who are food lovers themselves. 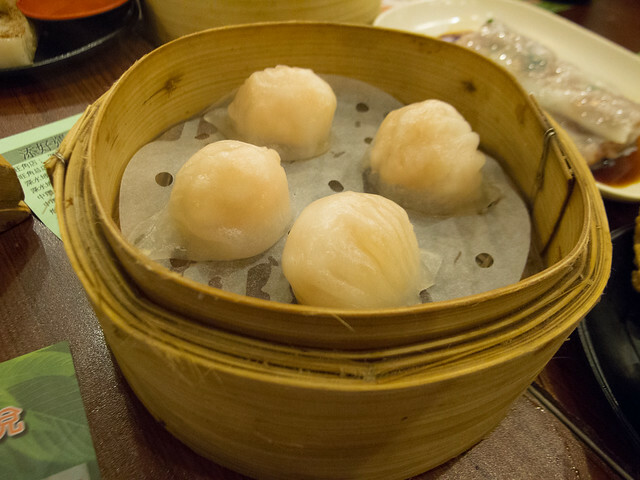 I was then made aware of the concept of fast food dim sum Michelin-star restaurants - something I dare say has got to be Hong Kong specialty - because I was surprised to discover that there is not one but multiple fast food starred restaurants here in Hong Kong. Tobias arrived in Hong Kong early on a Monday morning. I joined him and Jonas and tried out Tim Ho Wan, the Dim-Sum Specialists 添好運點心專門店 in Sham Shui Po 深水埗. The dish Tobias tried out was Chicken sticky rice / Lotus leaf rice 糯米雞 lo6 mai5 gai1 (Wikipedia). Glutinous rice is wrapped in a lotus leaf into a triangular or rectangular shape. 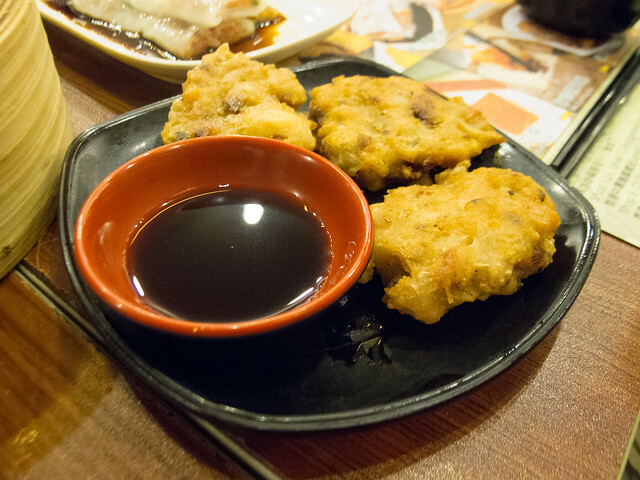 It contains egg yolk, dried scallop, mushroom, water chestnut and meat (usually pork and chicken). These ingredients are steamed with the rice and although the leaf is not eaten, its flavour is infused during the steaming. 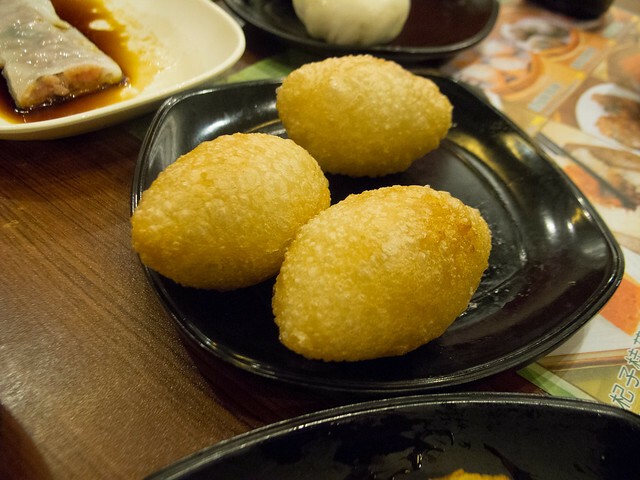 Lo mai gai is a kind of rice dumpling. A similar but lighter variant is known as "Pearl Chicken" (珍珠雞 jan jyu gai). It was pretty spectacular. Quite possibly the best Chicken sticky rice 糯米雞 I have had in my entire life. HIGHLY recommended. The video interview was a fun detour and it was awesome to see the pros in action, but let’s talk about the food. star fast food joints that I visited eventually that in Hong Kong, the price is rarely an indicator of how good the food is. In Hong Kong, restaurants cost more mostly because of its souped-up decor, the spectacular views, the spaciousness (and thus noise level), the convenience of being able to reserve a table (thus not having to wait in a long line). The quality of the food does not appear to factor into the price. We tried 10 dishes that day, and the Lo Mai Gai which Tobias got from his television interview. The bill was $179 HKD ($23 USD) for three - a bargain! Steamed meatball 牛肉球 (Wikipedia). 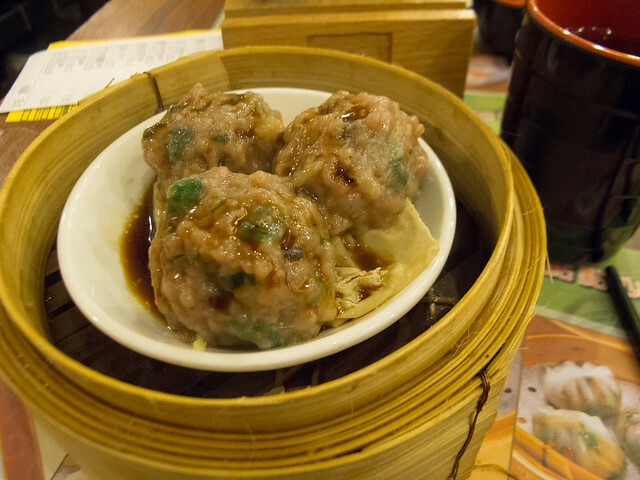 Finely ground beef is shaped into balls and then steamed with preserved orange peel and served on top of a thin bean-curd skin. These are juicy and succulent, and is Tobias’ favorite for the entire meal. Recommended. 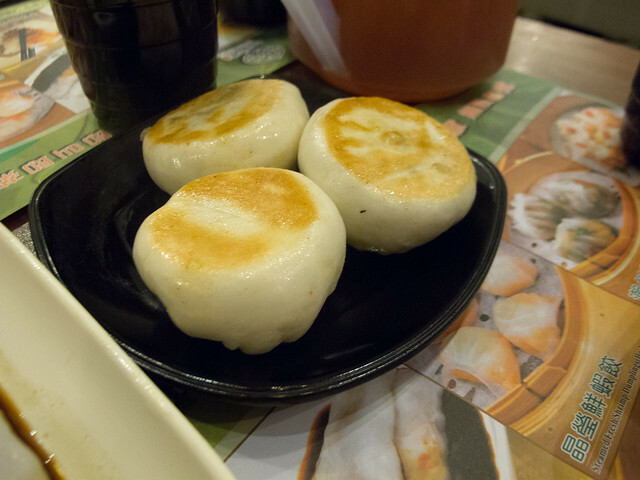 "Snow Mountain" Char siu baau (Baked barbeque pork bun) 雪山叉燒包 (Wikipedia). The most popular bun with a Cantonese barbecued pork filling. It can be either steamed to be fluffy and white or baked with a light sugar glaze to produce a smooth golden-brown crust. My favorite. We subsequently ordered another round. It was heaven on earth. HIGHLY recommended. Shrimp dumplings 蝦餃 (Wikipedia). (蝦餃 ha1 gaau2): A delicate steamed dumpling with whole or chopped-up shrimp filling and thin wheat starch skin. Well done, on par with places that serve the same dish for $60 HKD ($7.50 USD). 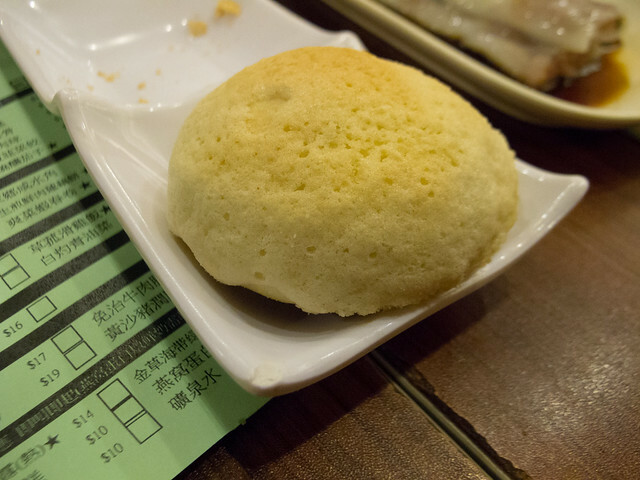 Though here at Tim Ho Wan, you pay one third of what you normally pay for the same quality. Salty Pastry 鹹水角 (Wikipedia). Made with flour and seasoned pork. This was good, though not as good as One Dim Sum 一點心 ’s (another Michelin-star dim sum fast food joint in Hong Kong). Vegetable Dumplings 菜餃 (Wikipedia). Gao, or Dumpling (Chinese: 餃; 餃子; Cantonese Yale: gaau2; gaau2 ji2): Jiao zi is a standard in most teahouses. They are made of ingredients wrapped in a translucent rice flour or wheat starch skin, and are different from jiaozi found in other parts of China. Though common, steamed rice-flour skins are quite difficult to make. Thus, it is a good demonstration of the chef’s artistry to make these translucent dumplings. 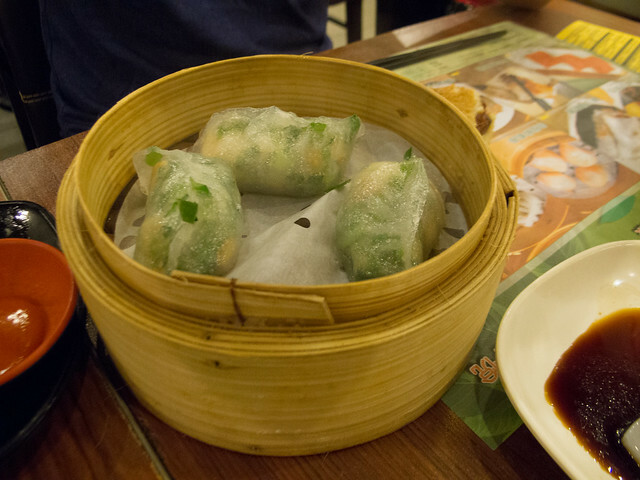 There are also dumplings with vegetarian ingredients, such as tofu and pickled cabbage. Nice soft skin and very fluffy stuffings. Recommended. Pretty good. Contains shrimp so tasted a bit of mashed shrimp pie. Sweet cream buns 奶皇包 (Wikipeia. Sweet cream buns (奶皇包 naai5 wong4 baau1): Steamed buns with milk custard filling. Turnip Cake 蘿蔔糕 (Wikipedia). 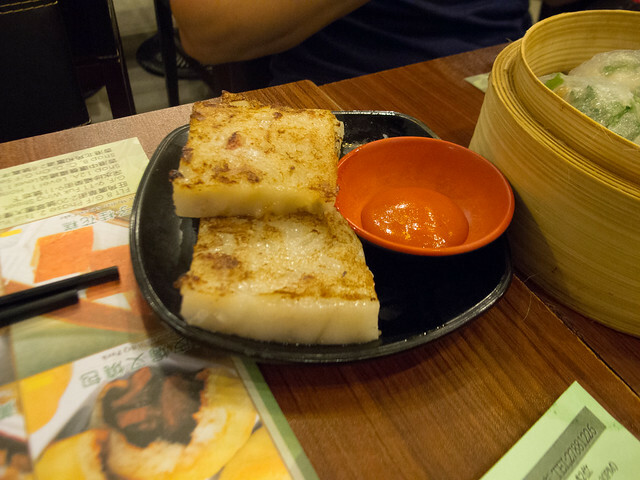 Cakes are made from mashed daikon radish mixed with bits of dried shrimp and pork sausage that are steamed and then cut into slices and pan-fried. Better than expected. Came with hot sauce which was unexpected. Recommended. Rice noodle roll 腸粉 (Wikipedia). 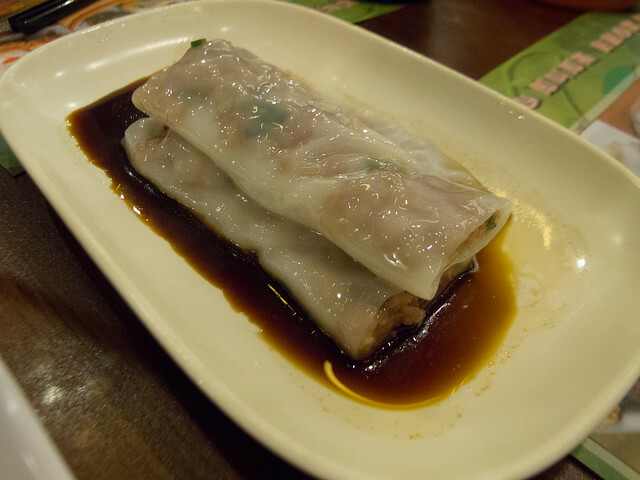 A rice noodle roll (also translated as steamed rice roll) is a Cantonese dish from southern China and Hong Kong, commonly served as a variety of dim sum. It is a thin roll made from a wide strip of shahe fen (rice noodles), filled with shrimp, pork, beef, vegetables, or other ingredients. Sweet soy sauce is poured over the dish upon serving. The rice noodle is also known as chee cheong fun where chee cheong means pig intestine, and fun means noodle; this is because the noodle resembles the small intestine of a pig. We had the minced beef variety. It’s good standard fare, though nothing special either. 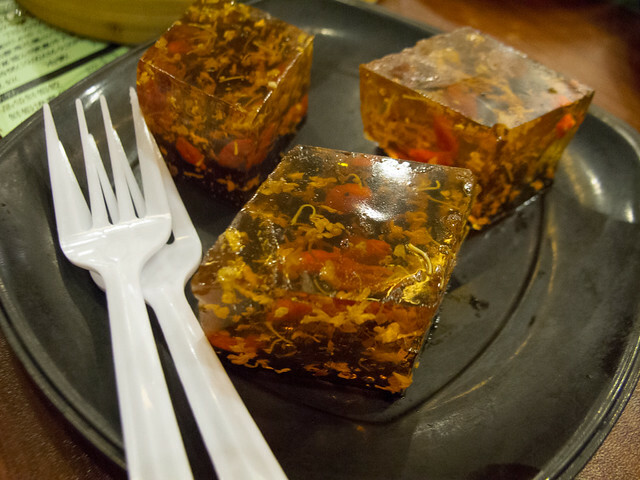 Osmanthus Jelly 桂花糕. Dessert dim sum. These are stunning! Light and fluffy. The jelly was so soft that there is no way to eat it with chopsticks, so forks were provided. HIGHLY recommended.